Mrs. O'Malley, I didn't know him like you knew him. I didn't know him long. But, he had tremendous potential as a trauma surgeon. He was very fast on his feet. He could think and act simultaneously under intense pressure. He had tremendous potential. And, you know, he was impatient. He wanted to become better, faster. He wanted to save more lives. He was good. And he was thoughtful and generous. I think in the end, I think he was heroic and noble. And I liked him very much. And I think he gave you a good read to be very very proud. 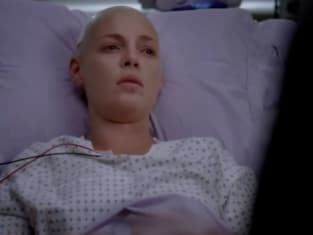 Grey's Anatomy Season 6 Episode 1: "Good Mourning"
In medical school, we have a hundred lessons that teach us how to fight off death, and not one lesson on how to go on living. According to Elisabeth Kubler-Ross, when we're dying or have suffered a catastrophic loss, we all move through five distinct stages of grief. We go into denial because the loss is so unthinkable we can't imagine it's true. We become angry with everyone, angry with survivors, angry with ourselves. Then we bargain. We beg. We plead. We offer everything we have, we offer our souls in exchange for just one more day. When the bargaining has failed and the anger is too hard to maintain, we fall into depression, despair, until finally we have to accept that we've done everything we can. We let go. We let go and move into acceptance.